Whenever he finished a good meal he would rest his hands on his belly with great satisfaction and announce, “I’m plofft”. 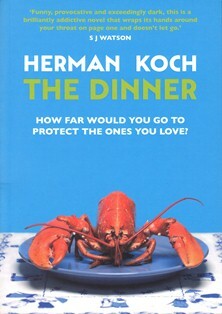 After reading The Dinner by Dutch author Herman Koch I, too, was plofft. The Dinner is a dark novel that takes place over the course of one evening. Two couples meet for dinner in a restaurant. There is underlying tension between them. As the evening transpires, it becomes clear they are here to discuss an unspeakable act committed by their teenage sons. But what have their sons done? And what do the two couples plan to do about it? I started The Dinner with a set of assumptions. My enjoyment of the book stemmed from the way in which Koch first plays along with those assumptions, then begins to challenge them and eventually turns them on their head. Koch writes with the theatre of a waiter making his way around a table, removing the silver cloche from each meal with great flourish. As the dinner progresses from aperitif to dessert, he lifts the lid on his characters and the back stories that have led to the evening. It will also give parents pause for thought – what would you do if your child committed the unspeakable? What a fabulous review. You definitely know how to get a person intrigued and interested. WOW...going to have to get this book. Thanks Elizabeth! Enjoy the book. Thanks Carole - done. Happy new year to you too, hope you're having a good one.